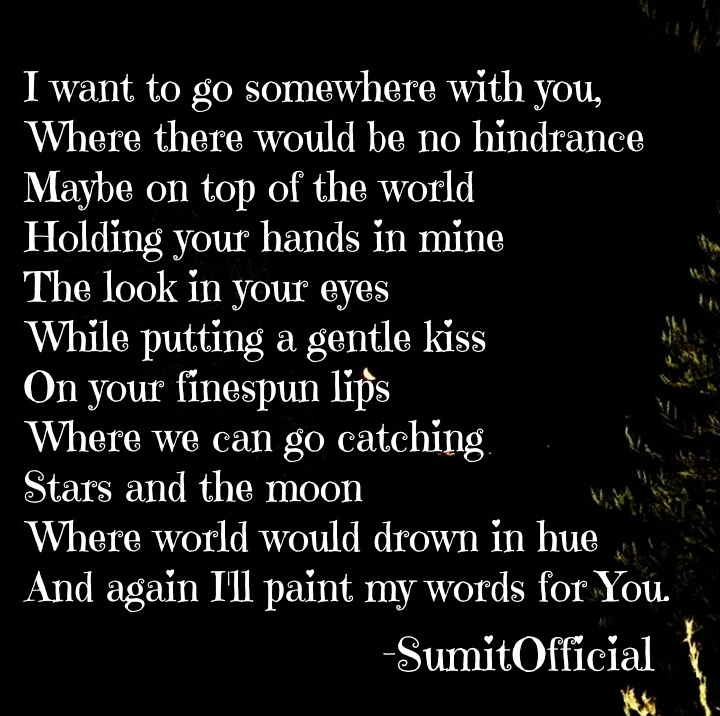 And again I’ll paint my words for You. It’s just beautiful. I love it! Heart-melting! I wish there would be another world without any differences. Where people can love without any restrictions! Alas if we can get there.the beauty of any poem is when the reader also sailes with the rhythm of the poem. You know exactly how to sweep someone off their feet. (; And hey, convey my fascination for the sketch to the artist, will you? Will I ever get enough of your beautiful words? Both are beautiful Sumit…the world you described as well as your poem. So very romantic! Beautifully expressed! Sumit, I loved it. You wrote a long composition after a long time and I literally was waiting for it. I was reading and visualizing it at same time. I don’t think you are just writer, you have become an artist. School is fun for me and its just because of my friends😂How are you doing? Who is this lady that’s got your heart??? Haha! Is it that hard? Yes! I think there is someone… come on Summit you can tell us 😄 if there really isn’t then do tell what would create a proposal from you? I’m very surprised you haven’t already got a ring on your hand to be honest as you seem such a nice guy and can win over a lady with your words too. Or do you choose/prefer single? Nothing wrong with that either but I’d think you’d be quite the hit with the ladies nearby! Hahaha! Elizabeth you are witty. Oh yes 22 is still so young I was barely 18 for my first marriage – have fun being single! Did that happen with your will? Yes, we don’t have arranged marriages here. I was young and in love, but sadly we had issues that I wasn’t ok to raise a baby with, but we’re still friends and had our perfect daughter together😊. I later married hubby#2, had my son by age 24, divorced by 28, we didn’t talk for long talk or see each other for like 15 years at all, had some issues with my son and been back living together for 2 years now. Weird right?!? I have nominated your lovely blog for One Lovely blog award. Keep writing such amazing blogs! I am delighted to know you liked it. Have you addressed it to anybody personally? I mean if you have a muse? You touch the delicate and sensitive parts of ones’ soul and conveys the untold and unimaginable. Keep up the good work and inspire us. It was fully deserved on your part. I just acknowledged what many others have been meaning to say. Attaboy!